December 4, 2014 by Ecommerce News. About Statistics with tags Switzerland. 5392 views. A recent study on Swiss ecommerce shows that in Switzerland, an online shopper spends an annual average of 1,600 euro, purchasing mainly clothes, transport and books. The total value of ecommerce purchases was about 8,1 billion Swiss Franc, which corresponds to 6,7 billion euros. These are some of the most important conclusions drawn by Swiss ecommerce association NetComm Suisse, who held a survey among 1,100 respondents. It also shows that the average annual online shopping expenditure per online shopper is higher in Switzerland than in Italy (€1247), Germany (€1247), France (€1140) or Spain (€1081). Only in the UK there’s a higher average annual online shopping expenditure: €1861. They study also Amazon and eBay were the most highly regarded operators, especially for the categories of fashion/clothing and travel/tourism. These sites account for more than a third (36%) of the total market value in Switzerland! 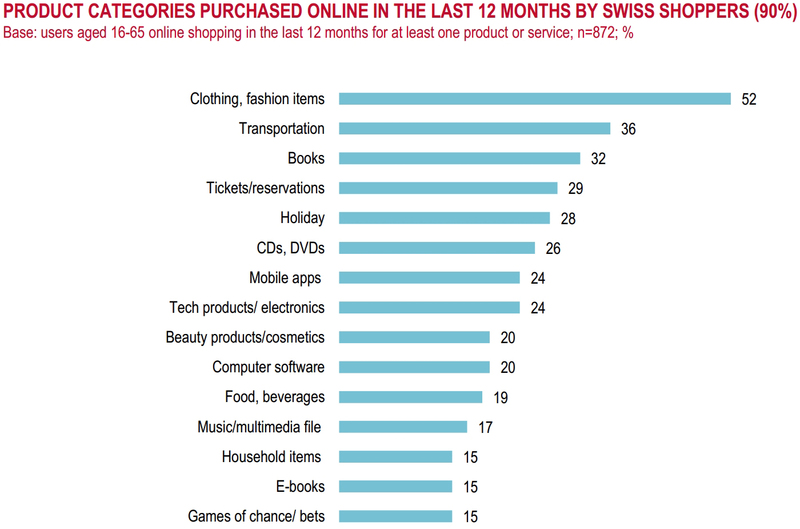 During the last twelve months, almost two-thirds (62%) of online shoppers in Switzerland bought something on foreign sites. 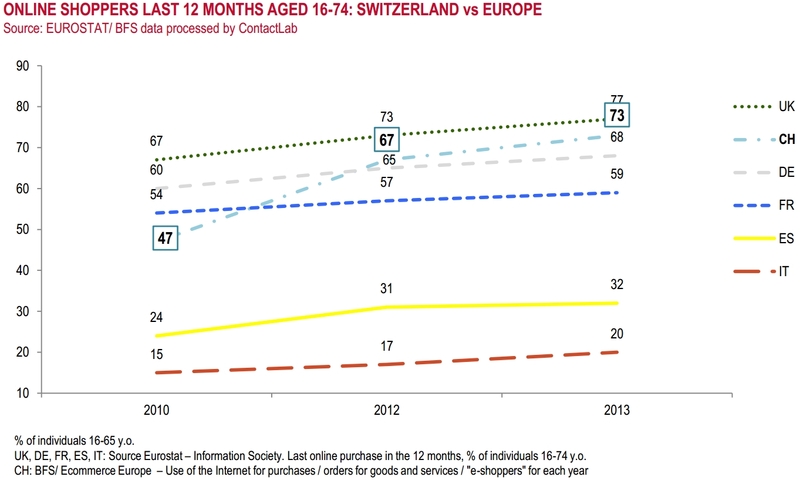 When Swiss shoppers buy online cross-border, they make purchases mostly from Germany, followed by France and the US. And Swiss cross-border shoppers generally spend more, around 2077 euro, which is 28% more compared to average annual online spending in Switzerland. 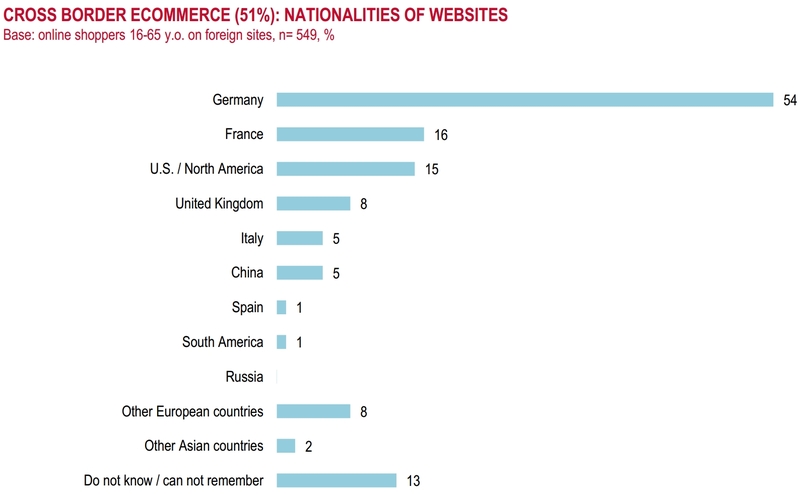 According to the study, 4% of Swiss online shoppers used exclusively foreign sites to shop online. On the other hand, 38% made purchases only on domestic websites. Altogether, almost all regular Internet users (90%) have made an online purchase over a 12-month period. About 55% of the people surveyed is a smartphone users. And of those smartphone owners, 9% uses this device weekly for online shopping, while 47% does this less often. And 44% has never shopped online using his or her smartphone. For tablet users (33% of all respondents) the percentages are: 16% (weekly), 49% (less often) and 35% (has never done this). NetComm Suisse also asked the respondents whether they users their smartphones in-store, for example to look for product information or to compare prices. About four in ten smartphone users did this often or sometimes. This percentage is higher than those in Italy, but lower than in the other big ecommerce countries, the UK (61%), Germany (53%), France (52%) and Spain (41%). Respondents also got the question what payment methods they prefer when paying online. 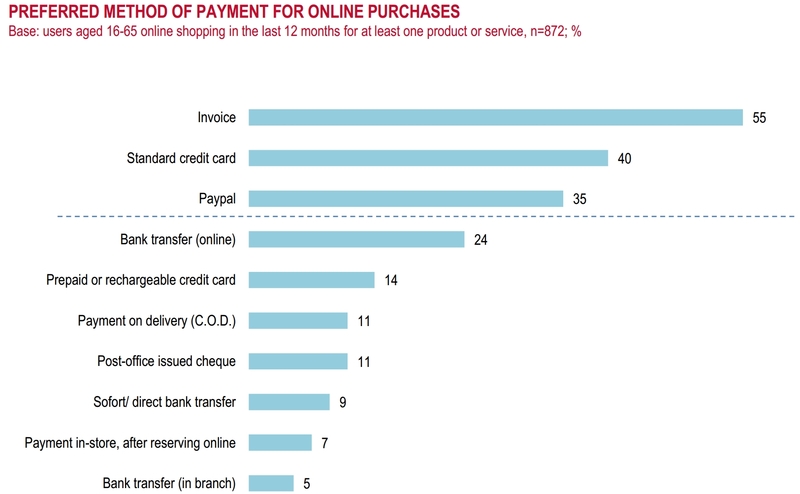 It seems that Swiss online consumers prefer to pay by invoice, followed by standard credit card and PayPal. An online bank transfer is also a popular payment method in Switzerland. Online shoppers were also being asked: “What are for you the most important considerations when you shop online or are planning to shop online instead of at physical stores?” For most people, it’s because shopping online saves them time, they can shop at any time and they are able to compare prices. Reasons to not buy online are they prefer to check the quality of the product in person and get advice from a trusted vendor, they think costs of shipping are too high or they just prefer to pay in cash.